From the costly velvets and furs worn by kings to the undyed wools and rough linens of the peasantry, the clothing worn by the various classes in the Middle Ages played an integral role in medieval society. In addition to providing clues to status, profession, and/or geographic origin, textiles were a crucial element in the economies of many countries and cities. Much of what is known about medieval fashion is gleaned from the pages of manuscripts, which serve as a rich source of imagery. 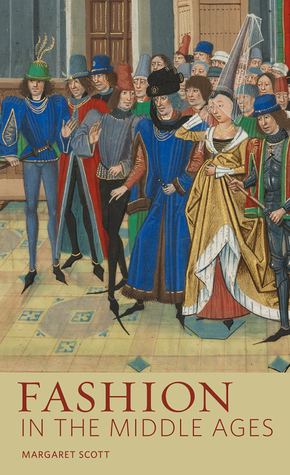 This volume provides a detailed look at both the actual fabrics and composition of medieval clothing as well as the period’s attitude toward fashion through an exploration of illuminated manuscripts in the collection of the J. Paul Getty Museum. The last portion of the book is dedicated to the depiction of clothing in biblical times and the ancient world as seen through a medieval lens. Throughout, excerpts from literary sources of the period help shed light on the perceived role and function of fashion in daily life. Fashion in the Middle Ages is a fascinating read. This beautifully illustrated volume comments on medieval dress by considering its portrayal in illuminated manuscripts of the time; therefore it is an interesting blend of fashion, history, and art. Some periods are better represented than others, but over all it is an informative work that is also a pleasure to flick through. It provides an excellent overview for those new to the study of medieval fashion, including a handy glossary at the back to explain the clothing terms used.